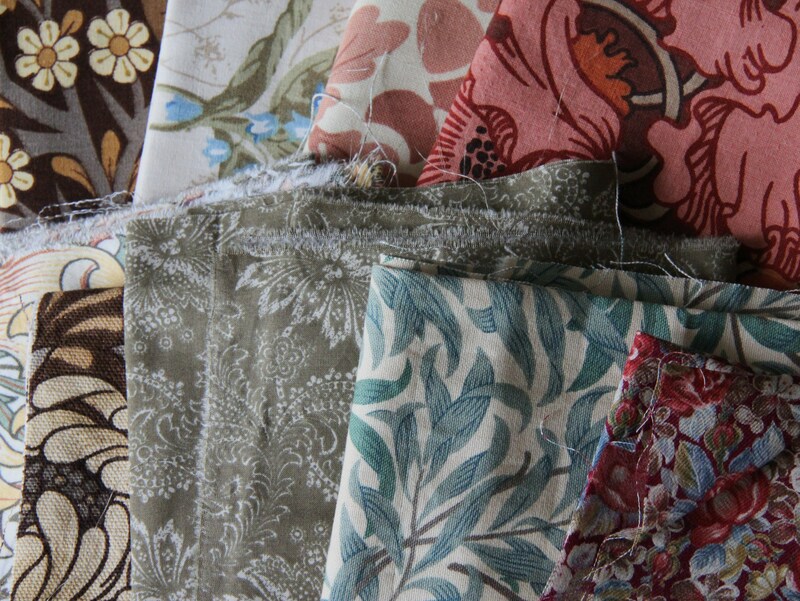 Those who have seen my stash of fabrics would no doubt be horrified to learn that I have been buying even more fabrics. Well, rather than buying just random fabrics as I have a habit of doing, this time I have been getting them for very specific projects. And no, I did not have suitable fabrics already in my stash. Most of my fabrics are modern colourful fabrics which, lovely though they are, are completely unsuitable for my new quilting plans. 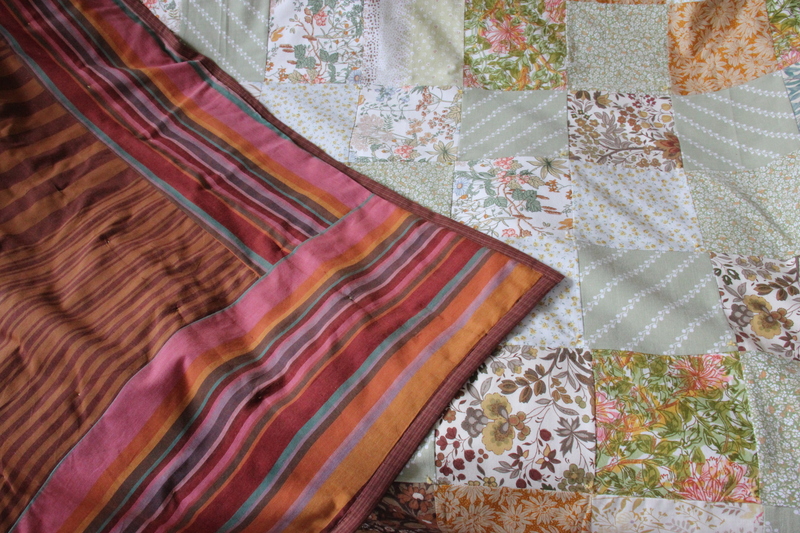 One of the plans is to make a double-bed sized quilt for us from vintage fabrics. My first vintage fabric quilt has been such a success my husband suggested I make another one, similar in style but bigger for our bed. Obviously I did not need much encouragement and instantly started surfing eBay and other trusted sites for suitable fabrics. 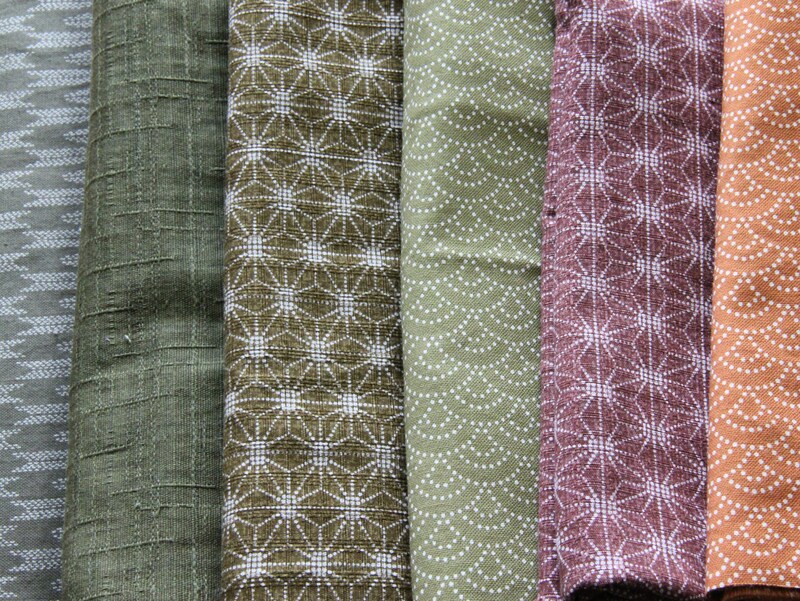 Some of the fabrics arrived today and they are truly lovely. The quilt is going to have an Arts & Crafts sort of feel, and based on the fabrics I’ve been able to find it looks like it’s going to be a mixture of brown, terracotta and bit of green. It’s been a couple of years since I bought the fabrics for my previous vintage quilt and I really noticed that the prices have been going up. I suppose vintagey things are pretty trendy at the moment so all the eBay sellers really know the value of their fabrics now. 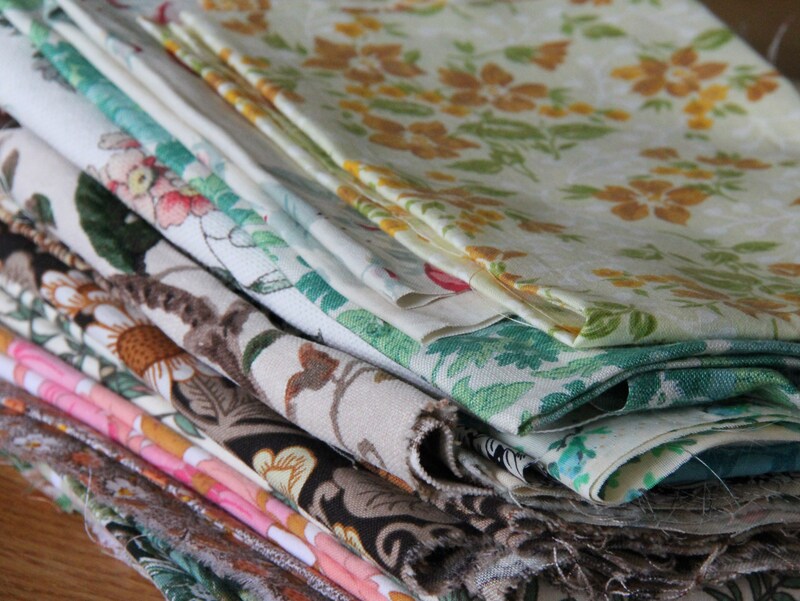 There are far fewer bargains to be had, and the best fabrics are now more expensive than new quilting fabrics, which didn’t used to be the case the last time I was shopping. A good example is Spinsters’ Emporium, a lovely site with a nice selection but very pricey. But I know the quilt is going to be really fabulous so it’s definitely going to be worth the cost. I’m so looking forward to making it. Categories: Fabrics, Quilting | Tags: quilting, vintage fabrics | Permalink. I have always admired fabrics men’s shirts are made from. They often have nice patterns and the fabrics themselves are lovely and smooth. 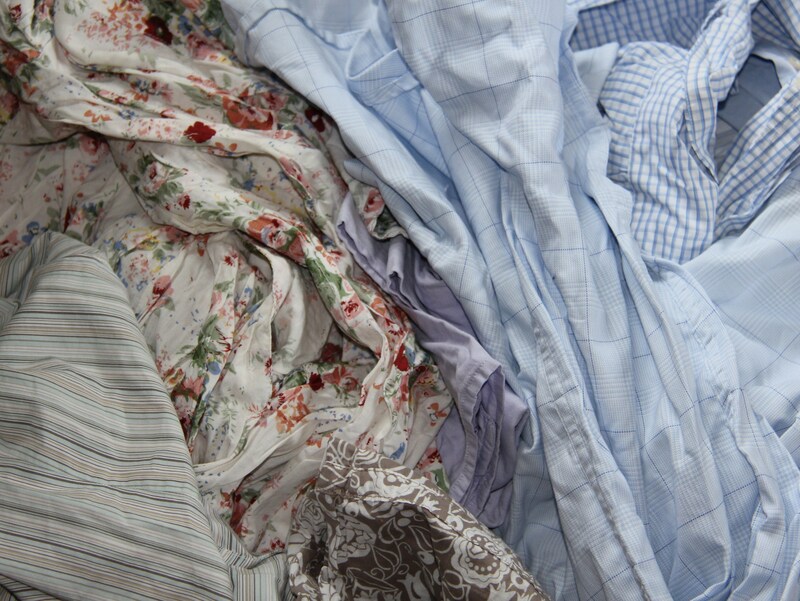 So for the last couple of years I have been hoarding my husband’s old shirts as I’ve been planning on making a patchwork quilt from them. In the last couple of days I have finally got on with it and started chopping them up. I’ve also been cutting up a few old tops and dresses of mine that have nice patterns. 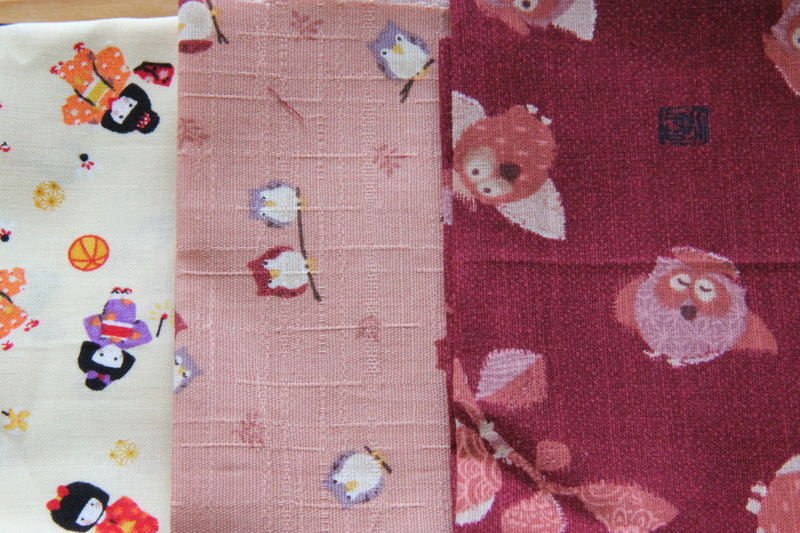 It’s not a very quick process, but at least I can feel smug about the free fabrics I am getting. 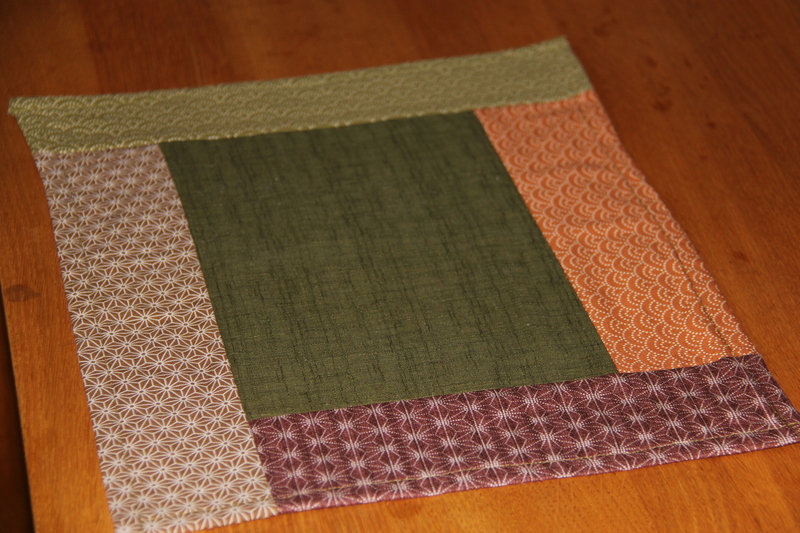 Categories: Quilting, Reusing old materials | Tags: patchwork quilts, upcycling | Permalink. There’s a side of me that likes all things old-fashioned. 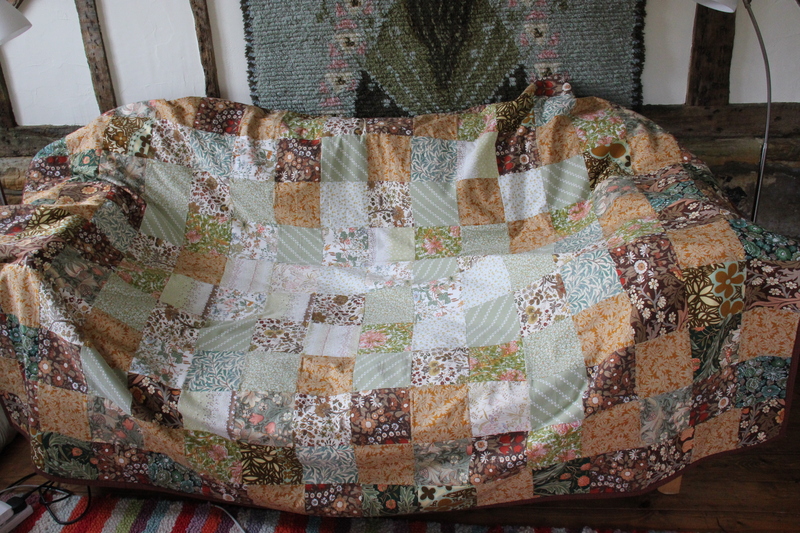 So when I decided to make a quilt just for me (rather than a present to someone else, as my crafts usually tend to be), making it from vintage fabrics was a natural choice. It was great to be able to pick fabrics that I love (as opposed to trying to think what sorts of fabrics someone else might prefer). 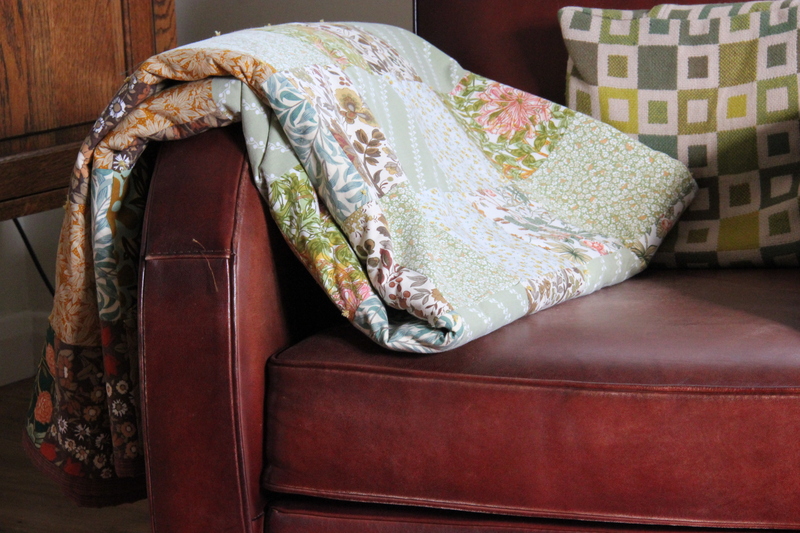 Vintage fabrics have a wonderful softness to them, both in terms of texture and colours which you only get once the fabric has been washed many times. 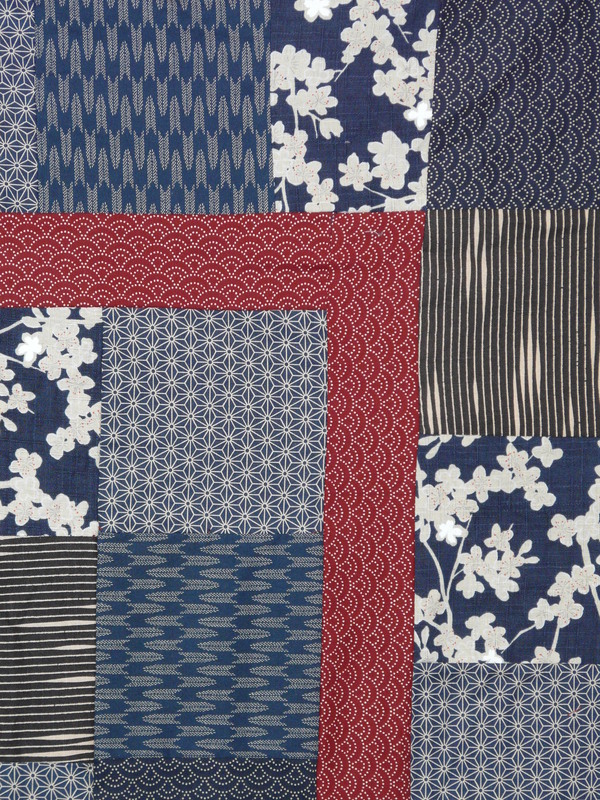 This quilt has some classic English fabrics from Liberty and William Morris, as well as some wonderfully wo rn-out pale green fabrics that look like they come from a 1970’s duvet cover. 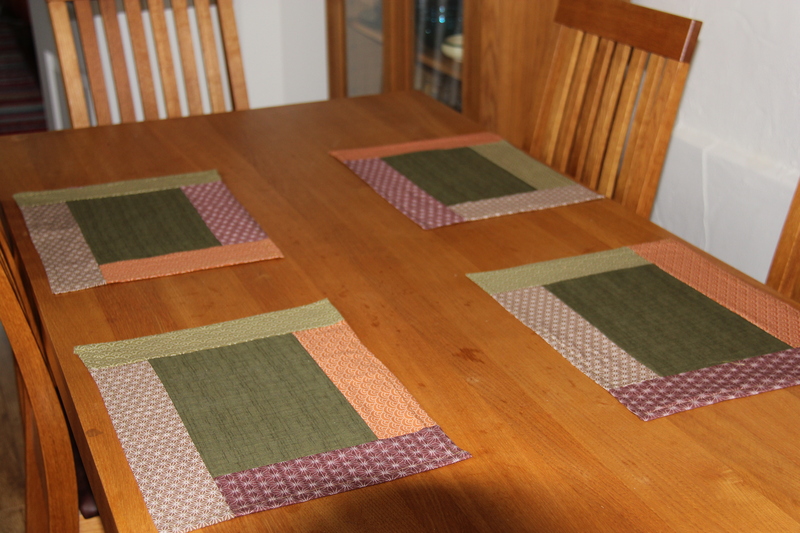 The backing fabrics are new (woven stripes designed by Kaffe Fassett) but the brown and ochre colours have an old-fashioned feel to them, and the fabric is beautifully soft, so I felt it was a good choice. Because this was my first ever quilt, and the fabrics were so beautiful in themselves, I decided to keep the pattern very simple, just traditional squares. I kept the darker fabrics to the edges, with the lighter ones in the middle, but I mixed them up a little bit to avoid any sudden colour changes. 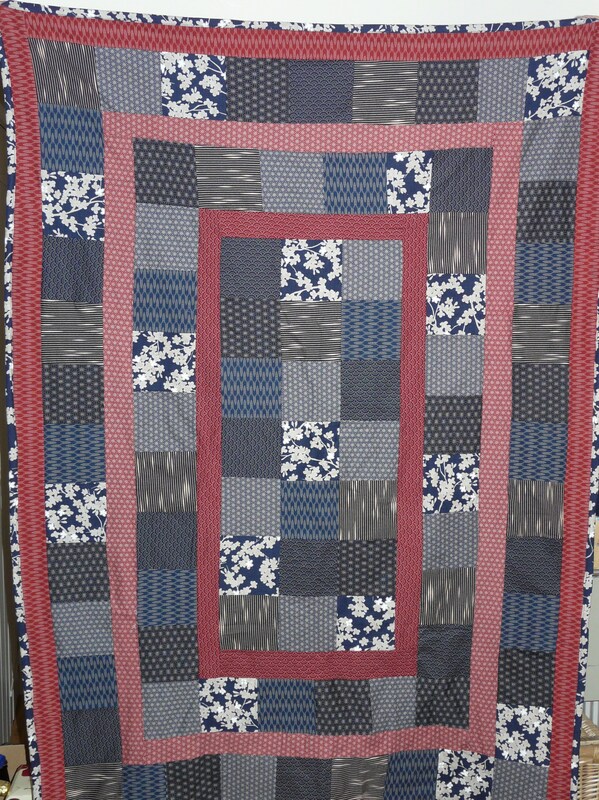 I tried to machine-quilt it, but that didn’t work properly as the backing fabric kept being crunched up. Instead, I decided to knot the layers together, rather than try to hand-stitch it. I like the resulting “unquilted” look. I call this quilt my “slow life” quilt, because it has taken me over a year to complete. It’s my biggest craft project during my illness that I’ve attempted so far and although I worked on it very slowly, with long gaps in between (for moving house and working on other projects), I’ve enjoyed every minute of making it. On the whole, it looks like a very traditional quilt, one that could have been made a long time ago, which is exactly what I wanted to achieve. So, all in all, I’m very pleased with the first attempt! Categories: Fabrics, Quilting, Reusing old materials, Vintage | Tags: fabrics, patchwork quilt, vintage | Permalink.